As we want to be able to sleep in the car in situations where this could be appropriate, we have a “queen size“ bed in the pop top for the parents and another, smaller, bed for the children behind the front seats. Where the atmosphere is relaxed and we want to stay longer, we can also have additional four beds in the Oztent RV4 (see “Gear“). This also can be used for guests! We have a waterbed at home and want to be able to sleep comfortably in the Land Rover as well, so we ordered a customized latex/slatted-frame mattress in Switzerland. There, Mr Meili, produces his famous “fanello inside“ sleeping system. 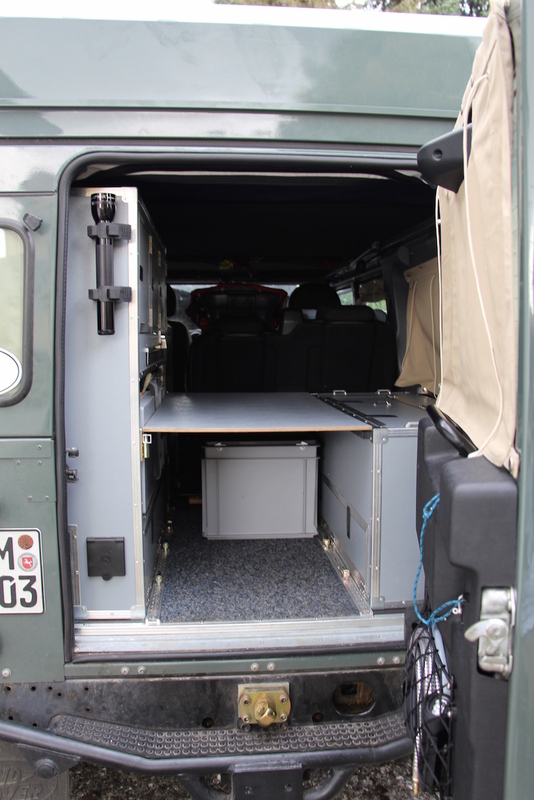 As we want to live in the Land Rover on a more or less permanent basis, boxes and bags didn’t seem to be the right answer for the question where to put all the gear, clothes and provisions. We decided to have a combination of a proper locker system and (some) boxes. 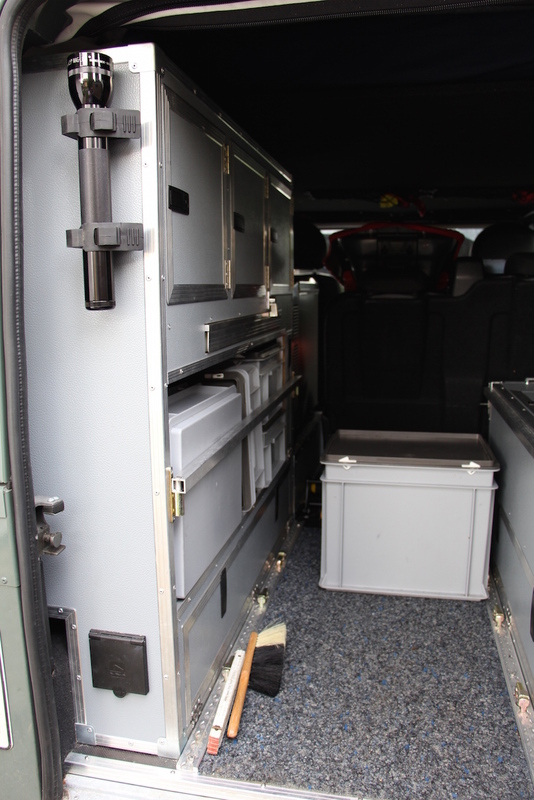 The locker on the driver’s side provides enough room for a lot of gear and clothes, and also is the place, where the small sink is located. 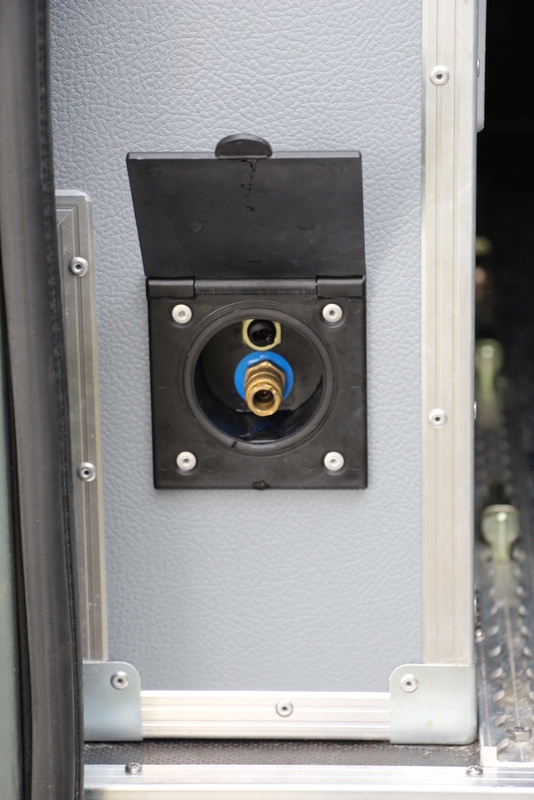 Water socket connected to the 75 liter tank. 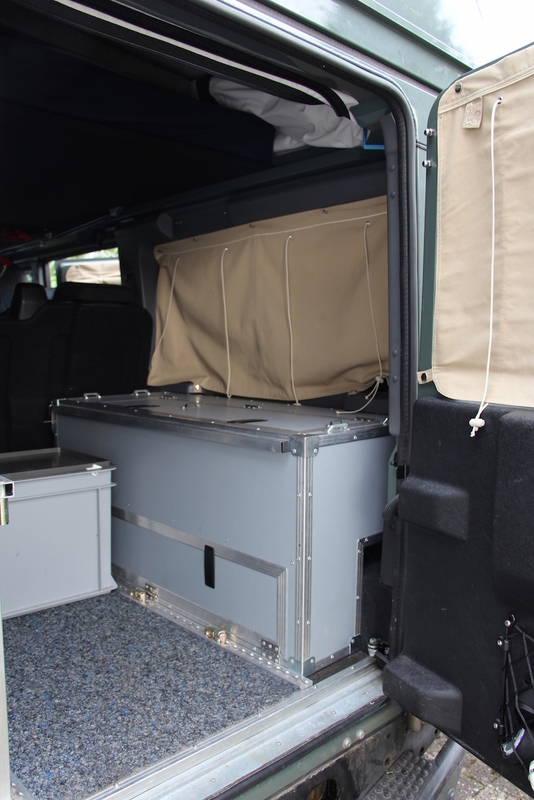 We have two water tanks, one in the passenger’s footwell with a capacity of about 70 litres and another 12litre tank under the sink. We also have a 12l grey water tank under the sink. 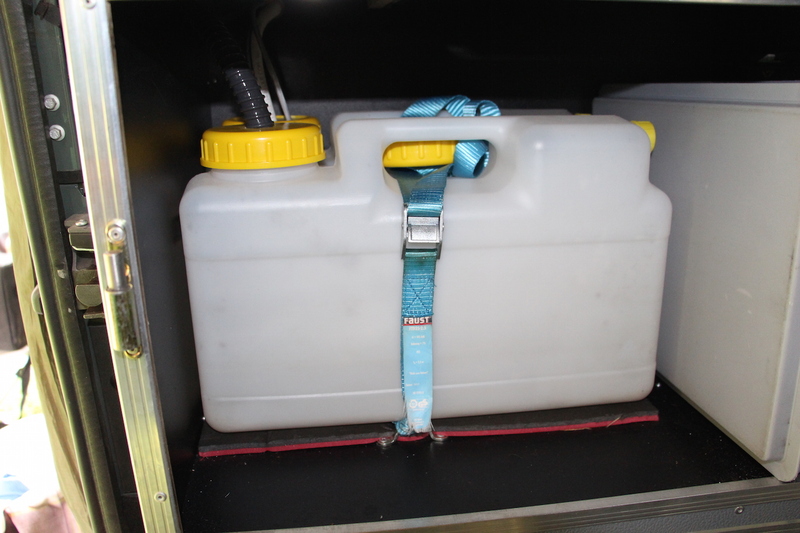 The 70l tank is used with the exterior shower / water socket at the back door. 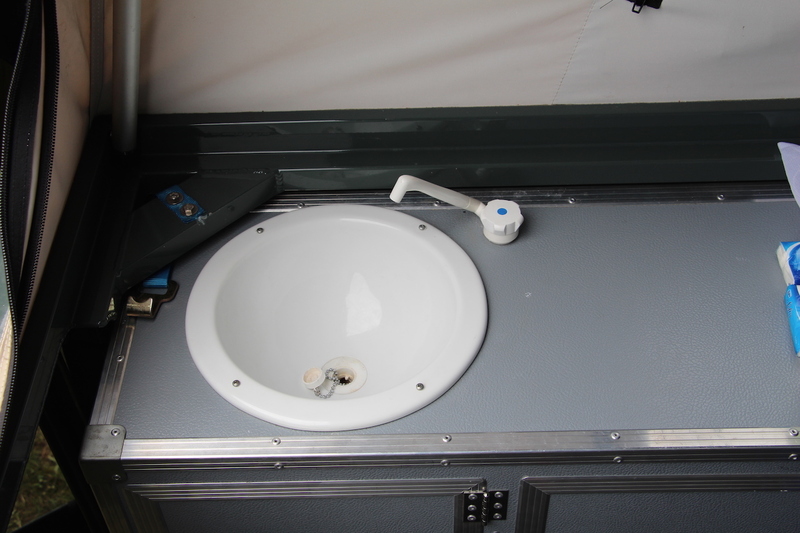 The sink was originally installed for tax reasons only, as in Germany a vehicle is less taxed when it’s a campervan and for being a campervan, you have to have a sink (in addition to a table, standing height, a cooker and beds). 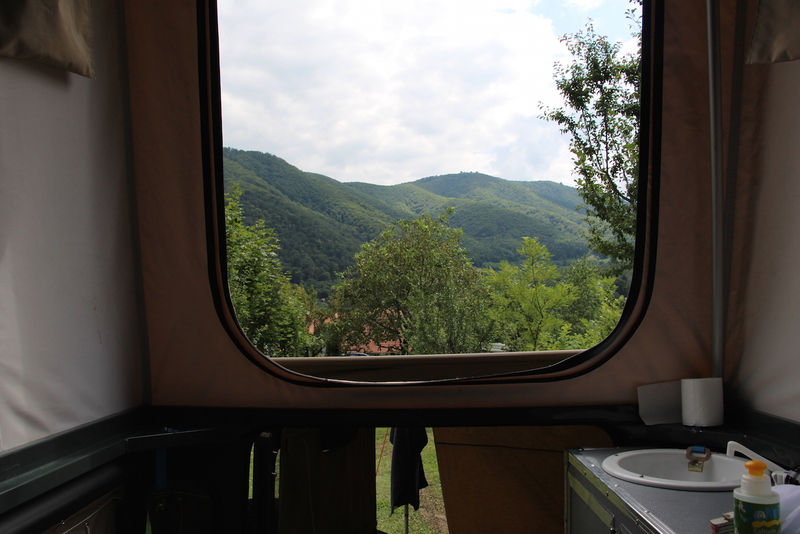 After our first experiences with the sink while travelling, today we would not want to miss it. It has proven to be quite useful in bad weather conditions or at night. 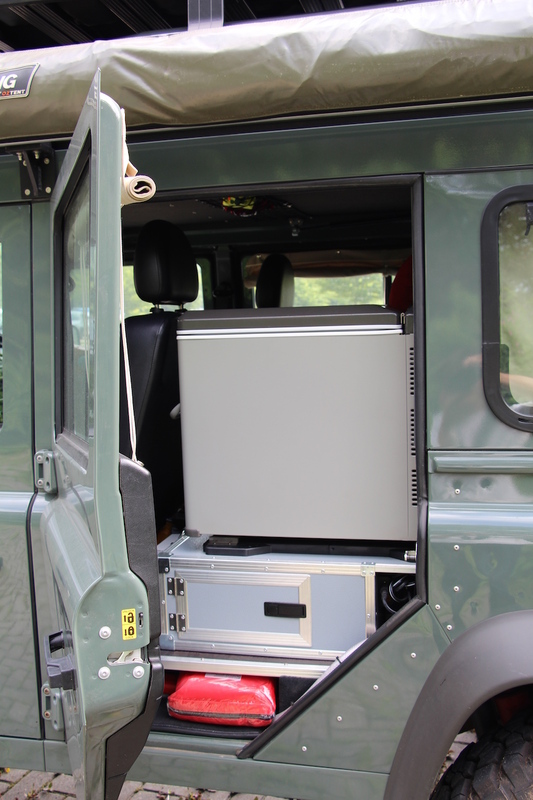 It’s quite good to have an additional battery for the fridge and other things, so that the starter battery as a really vital component for overland travel, especially as the Land Rover has a diesel engine, is not endangered to become drained. 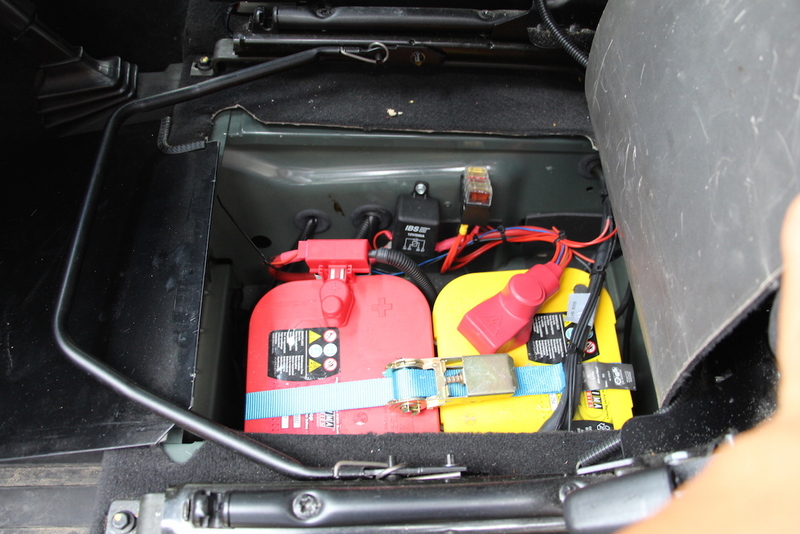 Both batteries are linked with a split-charge system, so that the alternator charges both batteries when the engine is running and if the engine is not running, both batteries are isolated. 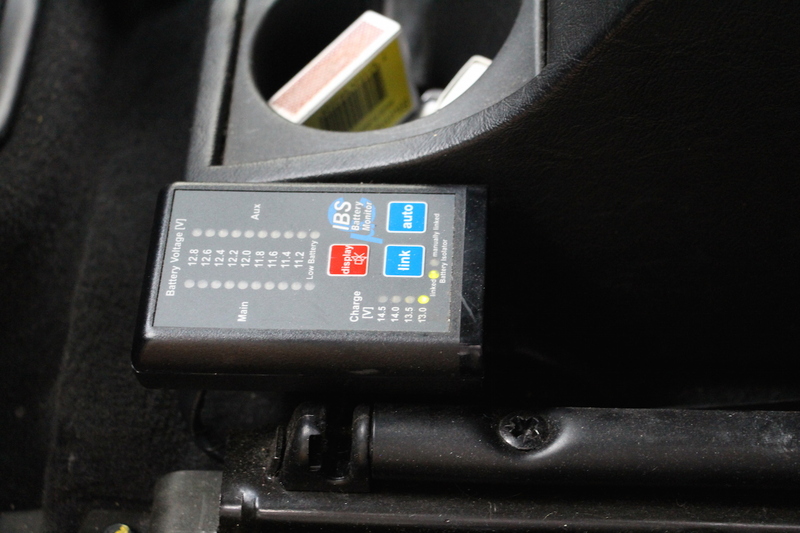 This system has also proven to be quite useful in case the starter battery is drained (e.g. in winter) ... you simply connect the two batteries manually with a switch and start the engine. 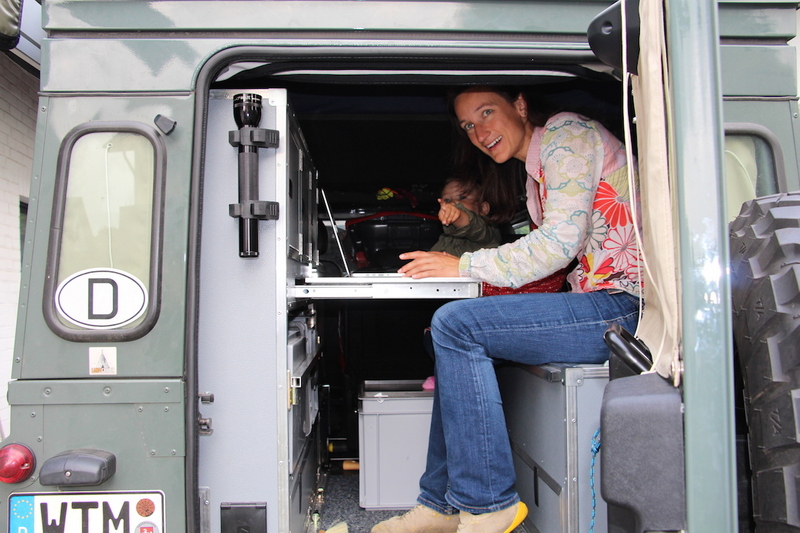 In addition to the alternator, a solar panel on the Land Rover’s roof behind the roof rack, is used to charge the batteries. This not only gives peace of mind, but also enables us to stay for a few days longer without driving. We always cook outside under the Foxwing awning, normally with the good old Coleman petrol stove. You’ll find more about our cooking utensils in the “Gear“ section. Imperishable food (i.e. canned or dry food) is stored in the locker-system and perishable foods are more or less in the Engel fridge. The Engel brand is well reknowned for its efficiency from the electric point of view and for its reliability and durability even in hottest climate conditions (it’s Australian, so it should be!). It is infinitely adjustable from + 10°C to – 18°C, can be used with 12V, 24V and 220/230V and can be taken out easily and fast. Its “Sawafuji Swing Motor“ also is very quiet!